A ready to use, liquid curing compound based on paraffin and also White Pigmented to substantially increase light reflectance to effectively prevent premature water loss from the concrete both due to heat of hydration and sunlight. Eliminates expensive methods of curing such as hessian-watering, etc. Sika India Pvt. Ltd. is a wholly owned subsidiary of Sika AG which is a globally active specialty chemicals company. Sika supplies the building and construction industry as well as manufacturing industries (automotive, bus, truck, rail, solar and wind power plants, facades). Sika is a leader in processing materials used in sealing, bonding, damping, reinforcing and protecting load-bearing structures. 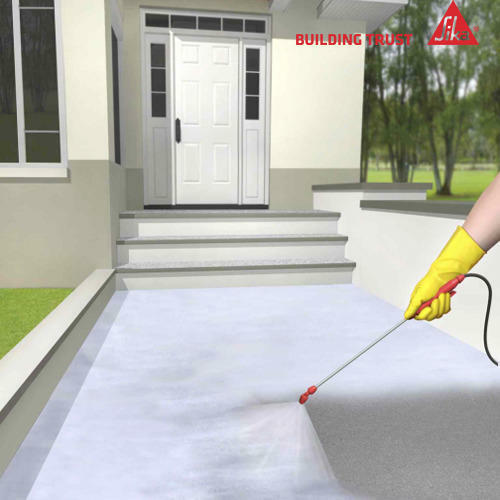 Sika’s product lines feature high-quality concrete admixtures, specialty mortars, sealants, and adhesives, damping and reinforcing materials, structural strengthening systems, industrial flooring as well as roofing and waterproofing systems.